Stephen Mugo of CIMMYT explains the MLN screening facility in Naivasha to partners. Photo: Joshua Masinde/CIMMYT. 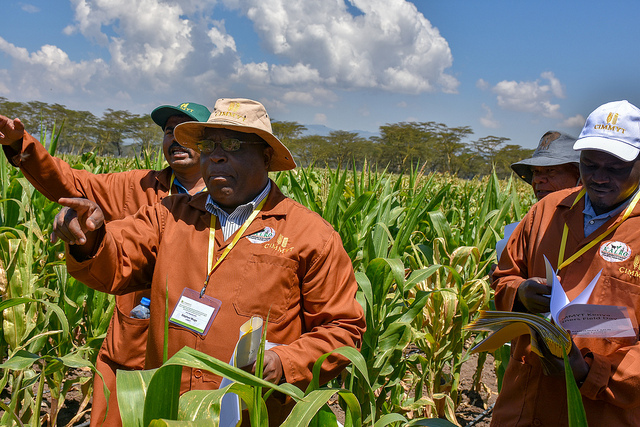 The maize lethal necrosis (MLN) artificial inoculation screening site in Naivasha, Kenya will begin the second interval of its phenotyping (screening/ indexing) cycle of 2019 at the beginning of April 2019. Interested organizations from both the private and public sectors are invited to send maize germplasm for screening. We received a wonderful selection of photographs that truly showcased the diversity of maize. Thank you to all those who submitted photos, and be sure to keep a look out for future photo contests. We look forward to featuring the winning photos on our new Instagram feed and other MAIZE social media channels.